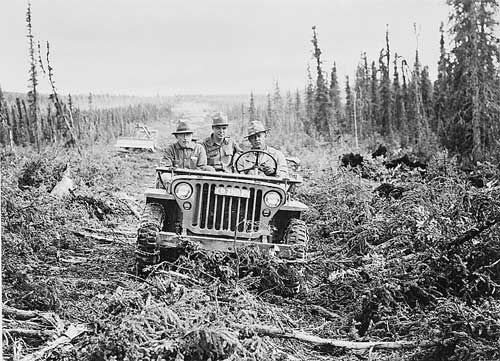 The Alaska Highway was completed on 20 November 1942. Construction was spurred on by the bombing of Pearl Harbor and really shifted into gear when the Japanese occupied Kiska and Attu Islands in the Aleutian Chain. Dubbed the Oil Can Highway, by the men building it, due to the enormous number of discarded 55 gallon oil drums long its route. The AlCan crossed over 200 streams and contained over 8000 culverts. 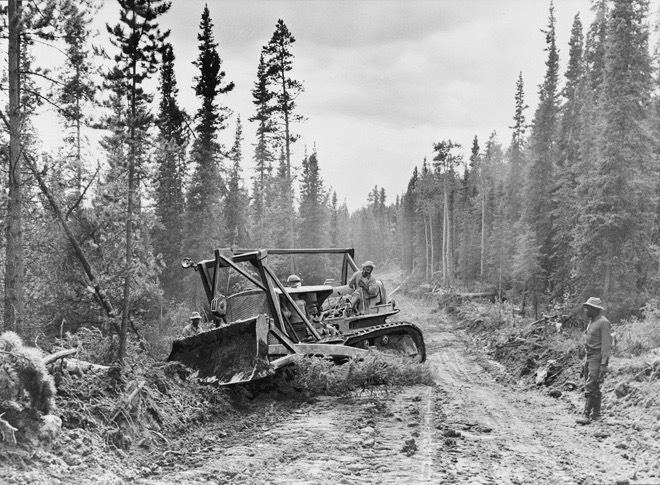 16,000 men built the 1700 mile road through the wilderness, at a cost of $138,000,000 in 8 months and 11 days. This entry was posted on Sunday, November 20th, 2016 at 12:23 PM	and tagged with Alaska, AlCan, Canada, driving, photo, WWII and posted in history. You can follow any responses to this entry through the RSS 2.0 feed. Interesting info–a great accomplishment. Sadly now days ( even in a wartime situation ) it would take 8 months for the politicians to decide how wide the road should be before starting the construction.